How to draft a Vendor Data Security and Confidentiality Agreement? 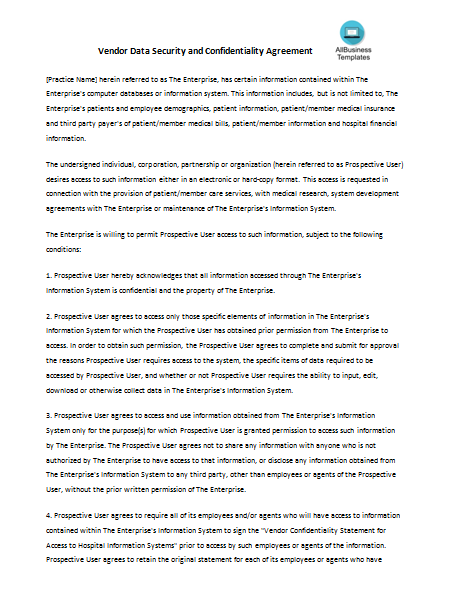 An easy way to start is to download this Vendor Data Security and Confidentiality Agreement template now! The Confidentiality agreement is also known as a non-disclosure agreement (NDA). This confidentiality agreement summons a legal agreement between two or more parties involved that have the knowledge and information about a confidential matter that has restricted or absolutely no access by any other person whatsoever. A non-disclosure agreement is generally signed between two companies to protect various secrets and hence enhance the trade relations between the two companies involved in the legal contract. The vendor confidentiality agreement might mean any data that identifies with Pace’s or its advisors’ or contractual workers’ past, present and future examination, advancement, business exercises, items, administrations, specialized learning, and representative data that might be gotten from Pace or from Pace’s experts or temporary workers. Download our Vendor Data Security and Confidentiality Agreement template now for your own benefit! This template will perfectly suit your needs!